Does oil spilled in 1969 still have impacts on wildlife? Ask a fiddler crab. This is a story about persistence—of oil, and of people. 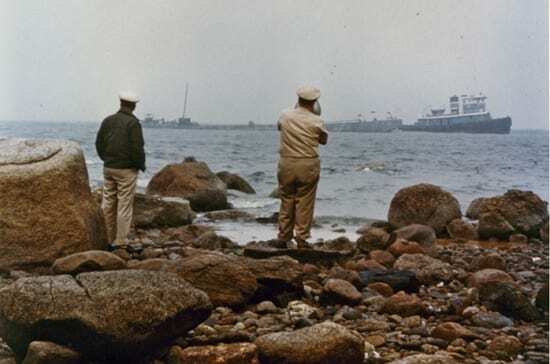 It began in 1969 when the barge Florida ran aground off Cape Cod, spilling 189,000 gallons of fuel. 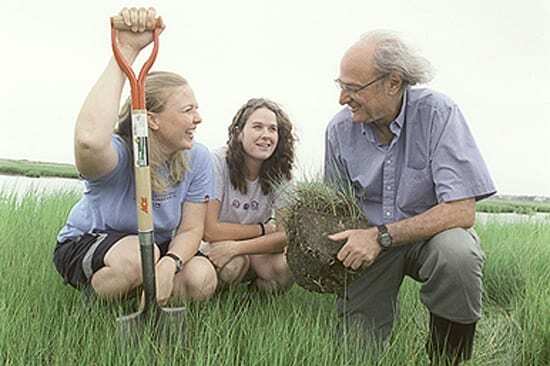 But it began for me in 2000, when Aubrey Hounshell kept calling me, asking if he could come to Woods Hole Oceanographic Institution (WHOI) for a summer internship to do some science. He was a 20-year-old undergraduate at the University of Hawaii, with less-than-stellar grades, particularly in my field, chemistry. Still, there was something about him that reminded me of me at that age: someone perhaps a little rough around the edges, whom people had taken a chance on and given a shot. So I let Aubrey come as a summer guest student in my lab, to get a taste of science, to test-drive it to see whether he might want to pursue it. Maybe it was his persistence, a useful attribute in the scientific endeavor, which often winds down long pathways, hits temporary dead-ends, segues serendipitously, circles around, and occasionally leads to an unexpected destination. That’s what happened in this case. For his summer project, we dispatched Aubrey to the Wild Harbor salt marsh in West Falmouth, which had taken a savage hit from the 1969 Florida oil spill. In its aftermath, WHOI biologists and chemists took advantage of the unfortunate incident. They brought to bear a full suite of expertise and technology to document the devastation to plants and wildlife and to learn how natural ecosystems respond to uninvited guests such as oil. And they found, contrary to prevailing ideas, that oil persisted in marsh sediments years after it disappeared from the water and beaches. We thought it might be an interesting scientific project for Aubrey to see if, three decades later, oil remained in Wild Harbor. Aubrey took cores of marsh sediments and helped analyzed them. He was proud to be an author on the scientific papers we published documenting our surprising finding: Oil from the 1969 spill resided in the marsh in 2000. 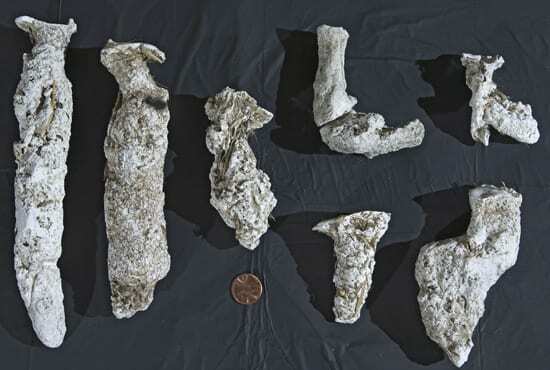 This finding inspired a cascade of intriguing questions: How much oil from the 1969 spill actually remained? Where was it most concentrated? Which particular chemical components of the oil remained? Were these components toxic to life? Had bacteria decomposed the oil? Since Aubrey’s summer discovery, my research group and many colleagues, armed with some of the most advanced chemical instruments in the world, have attacked these questions. With colleagues from the United States Coast Guard Academy, we employed comprehensive two-dimensional gas chromatography to determine that the remaining oil was not substantially weathered or biologically degraded, as we expected; in fact, it hadn’t changed much since the mid 1970s when most of the work at this site stopped. Emily Peacock, a Boston University Marine Program student and a WHOI guest student, took 26 additional cores over a wider area of Wild Harbor. We analyzed more than 150 oil samples. With Andy Solow, director of Marine Policy Center at WHOI, we developed a statistical model that helped fill in the gaps where we didn’t sample and create a map identifying where oil most likely remained in Wild Harbor. The map was essential to calculating how much oil was left in the marsh—about 100 kilograms (220 pounds). Not much, but was it enough to still have impacts on the ecosystem? To answer that question, Helen White, a former MIT/WHOI Joint Program graduate student and now a postdoctoral investigator at Harvard, analyzed our Wild Harbor oil samples to see if they contained specific compounds, known as polycyclic aromatic hydrocarbons, or PAHs, which are suspected to be toxic to life. PAHs were there, an indication (though not proof) that life in the marsh might still be affected by the 1969 spill. Next we wondered if bacteria were still consuming and decomposing the remaining oil—a question explored by a postdoctoral investigator, Greg Slater, who is now an assistant professor at McMaster University in Canada. He had to build a special stainless steel device to collect sufficient amounts of marsh sediments to obtain and isolate infinitesimal amounts of bacterial biomass for analysis. Using the National Ocean Sciences Accelerator Mass Spectrometry Facility (NOSAMS) at WHOI, Slater measured the radiocarbon content of phospholipids from bacterial cell membranes and found that bacteria in 2001 were not eating the oil. Which led to the next question: Did bacteria merely stop eating the oil recently, after consuming the most easily digestible chemical components 10 or 20 years ago? 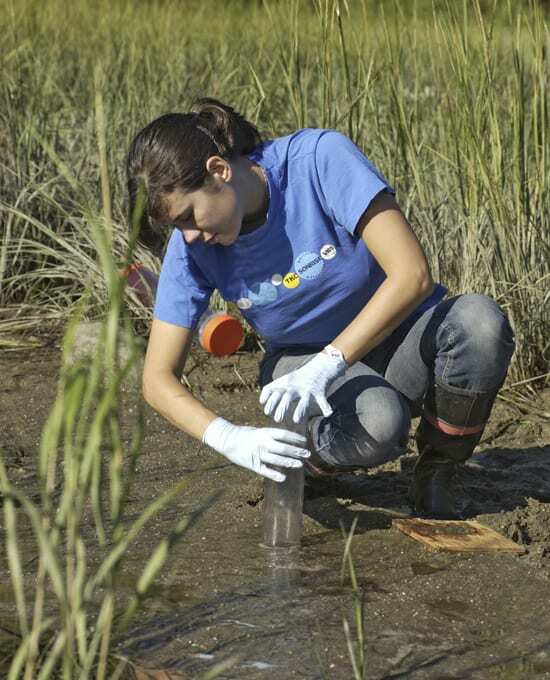 For her Ph.D. dissertation, Helen White analyzed remnants of organic matter in the marsh, also using the NOSAMS facility. She showed that it was not created by bacterial degradation of the oil. Both Slater’s and White’s results revealed that bacteria degraded the most easily eaten oil compounds soon after the spill and then moved on to their more typical fare. From our geochemical perspective, this flurry of research on Wild Harbor has added a wealth of valuable knowledge on oil spills. Yet, whenever I gave talks or was interviewed about the research, I was never able to answer the most frequently asked question: Does the oil still affect wildlife in the marsh? My standard response had been that the levels of toxic PAHs we found suggest that wildlife would still feel impacts. This answer frustrated not only the audiences, but me, too. My saviors for this problem have been Jennifer Culbertson, a Boston University Marine Program Ph.D. candidate and WHOI guest student, and her advisor, Ivan Valiela, a noted marine ecologist from the Marine Biological Laboratory. When Professor Valiela approached me about studying the biological effects of the 1969 spill, I was thrilled with the prospect of working with him. I was such a junior scientist in another discipline, and he could address the questions that I could not answer. He also had the ideal student in Jennifer. Before attending graduate school, she had worked on salt marsh restoration for the U.S. Army Corps of Engineers and was interested in salt marsh recovery from oil spills. Jennifer then trumped our fancy geochemical data and provided irrefutable evidence that the oil from the 1969 spill still affects wildlife, in particular fiddler crabs. 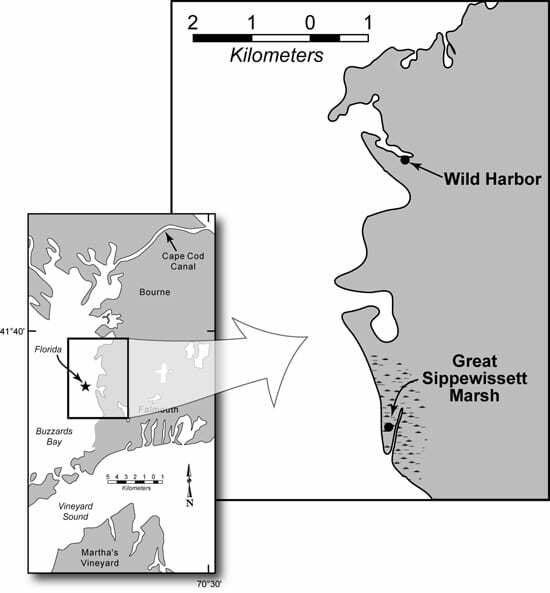 The research, published April 2007 in Marine Pollution Bulletin, showed that the crabs do not burrow as deeply in the areas still impacted by oil as they do in oil-free areas in Wild Harbor or in a control site, Great Sippewissett Marsh. Using only elbow grease and a few gallons of plaster of Paris, Jennifer and several summer students made casts of the crab burrows at these locations. Though I jest that our geochemical data was insignificant, Jennifer’s fieldwork was guided by Emily Peacock’s maps identifying oil hotspots in the marsh. 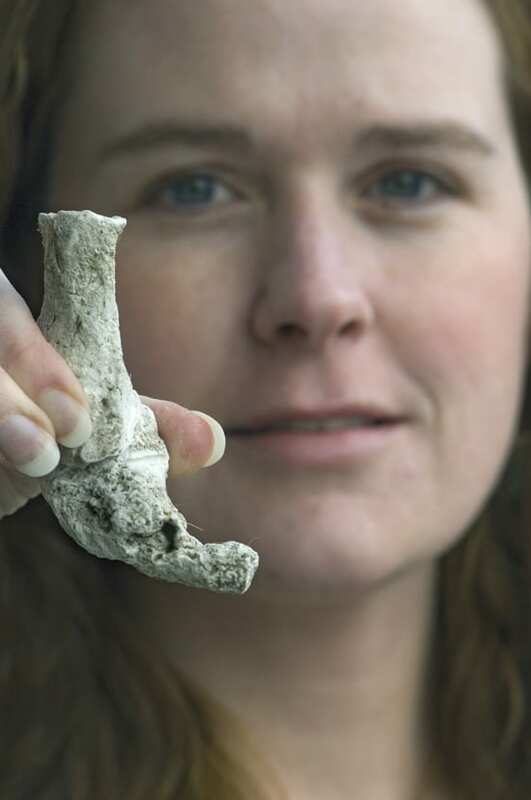 Jennifer found that in areas where Emily had found oil, there were fewer crabs, and they moved more slowly—as if they were literally intoxicated from exposure to the residual oil. More significantly, Jennifer observed that in areas where oil concentrations were higher, the crabs stopped burrowing downward when they ran into oil, began to burrows sideways in the sediments, and then turned back up. The crabs’ inability to make normal deep burrows has direct implications for the crabs and other biota in the marsh. The crabs cannot hide as well from predators, such as raccoons. 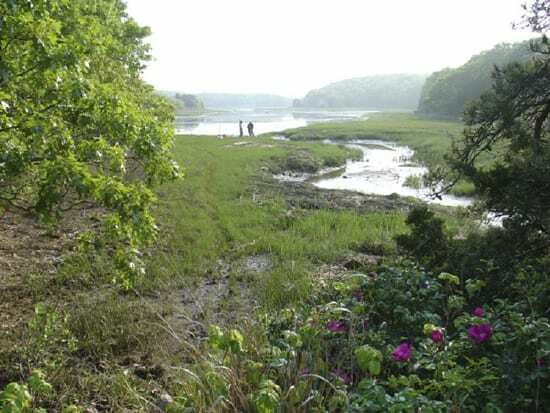 In addition, fiddler crabs normally play a crucial role in tilling the salt marsh, which helps provide oxygen to the roots of salt marshes grasses. 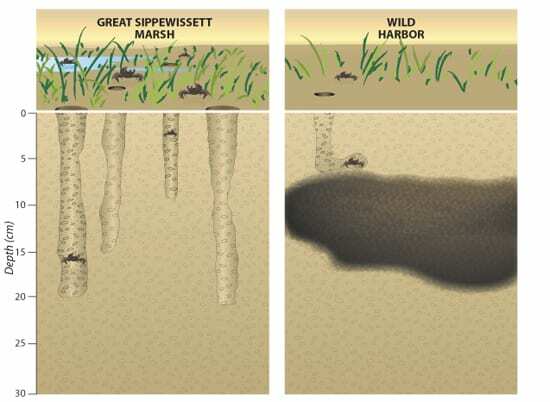 Somewhat like the iron rods in poured concrete, salt marsh grasses provide strength and stabilize the marsh against erosion. The consequences of these results are far-reaching. For example, this work provides direct answers to a high-priority item in the National Research Council’s 2003 study Oil in the Sea III, which stated that more information was needed about the chronic biological effects resulting from petroleum hydrocarbons in sediments. Jennifer’s experimental design was similar to research done within a few years of the spill by graduate students Kathy Burns of the MIT/WHOI Joint Program and Charlie Krebs of the Boston Univeristy Marine Program, who observed the same patterns for the crabs’ burrowing capacity in oil-polluted sediments. Hence, Jennifer’s results indicate that long-term exposure does not promote resistance, but chronically impairs these crabs. This research will also help damage assessment teams evaluating how to restore and rehabilitate oil-polluted locations per the Oil Pollution Act of 1990. This law states that the responsible party (the spiller), under the guidance of government scientists, must make every effort to clean up and return any ecosystem to its pre-spill status. Often the health of an ecosystem is gauged by its visual appearance. In the case of Wild Harbor, this would be misleading, because it now has a picture-postcard appearance. Who would have ever known that only a few inches below the surface, a nearly four-decade-old oil spill would be wreaking havoc on these crabs? For me, I learned a valuable lesson that sometimes the finest chromatographs and mass spectrometers cannot outdo simple, old-fashioned, get-your-hands-dirty research. This research was supported by funds from the WHOI Sea Grant Program, the WHOI Coastal Ocean Institute, the U.S. Office of Naval Research, and the Hollis and Ermine Lovell Charitable Foundation.